Russia has warned against unilateral action in Syria after President Barack Obama said the US might intervene militarily if Damascus used chemical weapons on the rebels. Russian Foreign Minister Sergei Lavrov said there should be no outside interference and countries should “strictly adhere to the norms of international law”. On Monday, President Barack Obama said the deployment of chemical weapons represented a “red line” for the US. Meanwhile, troops are reported to have stormed a western suburb of Damascus. On Tuesday, Russia’s foreign minister held talks in Moscow with China’s top diplomat, State Councilor Dai Bingguo, and a Syrian government delegation to discuss the conflict, which the UN says has left 18,000 people dead. Russian Foreign Minister Sergei Lavrov said there should be no outside interference and countries should "strictly adhere to the norms of international law"
After meeting Dai Bingguo, Sergei Lavrov said Moscow and Beijing based their diplomatic co-operation on “the need to strictly adhere to the norms of international law and the principles contained in the UN Charter, and not to allow their violation”. 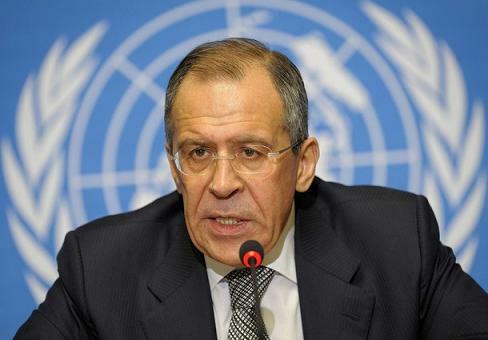 “I think this is the only correct path in today’s conditions,” Sergei Lavrov added. He said only the UN Security Council could authorize the use of force against Syria, and warned against imposing “democracy by bombs”. He also told Syrian Deputy Prime Minister Qadri Jamil that he wanted to hear his plans for “further actions to shift the situation into the channel of political dialogue in order for Syrians themselves to decide their fate without external interference”. Qadri Jamil said external interference was “hindering efforts for Syrians themselves to resolve this problem”. Russia and China have opposed intervention in Syria since anti-government protests erupted in March 2011. They have vetoed three Security Council resolutions seeking to press President Bashar al-Assad to end the violence. On Monday, Barack Obama warned Syria’s government at a news conference that “there would be enormous consequences if we start seeing movement on the chemical weapons front or the use of chemical weapons”. Barack Obama said that he had not ordered military engagement “at this point”, but added that the US was monitoring the situation carefully and had made contingency plans. In July, the Syrian government admitted that it had chemical and biological weapons and might use them in case of any “external aggression”. But it insisted they would “never be used in the Syrian crisis, no matter what the internal developments”. Correspondents say there is also growing unease in Washington that Syria’s chemical weapons may fall into what Barack Obama termed “the hands of the wrong people”. On Tuesday, soldiers were said to have stormed the western Damascus suburb of Muadhamiya. At least 23 people were killed and shops and houses were set on fire after government forces entered Muadhamiya at dawn, looking for rebel fighters, opposition activists said. The bodies of several men who had been shot at close range were found inside buildings after the troops withdrew from the town, they added. There was reportedly also heavy shelling and fierce fighting in the southern town of Herak and in the northern city of Aleppo, where the Japanese journalist, Mika Yamamoto, was killed on Monday. A commander in the Free Syrian Army, Col Abdul Jabbar al-Ukaidi, told the AFP news agency that its fighters now controlled “more than 60%” of Aleppo, although a security source in Damascus dismissed the claims.